It might be a case where the Bumblebee is early enough that they can tweak the script and use it as a reboot springboard. There's also the question of how much was spent on promotions, and how significantly viewed the domestic take is vs international. I don't think it's a death knell for the franchise either -- that'll need another film underperforming this dramatically or worse -- but it probably could and should cause a sea change in the way things are done. Is that really the case? I mean, the live-action toylines have been growing smaller and smaller so it seems like the others have become more reliable. Making back your production budget isn't the same as making back your marketing budget (which is usually not disclosed). For a summer blockbuster, it usually needs to make back twice the production budget to actually break even. ...This makes me so glad The Hub folded and Hasbro's "We're An IP Company!" stuff backfired, or they'd be in for some rough times. Edited by Spark, 28 June 2017 - 09:04 AM. I suspect that's just as much Hasbro tailoring things more (or a bit too) conservatively for the current retail environment, but yeah, Generations has really taken off in a big way seemingly starting with T30. That said, I think the franchise is MUCH healthier than something that needs an IV drip. It's not that simple. The studio only keeps a percentage of the gross. A good rule of thumb is 60% domestic, 40% International. China is on the low side at 25%. Then you also have to factor in marketing expenses. Figure that those expenses will come in at a quarter to a third of the production budget. Then you have to figure that there are opportunity costs to having your money invested in a movie. If you're spending 200 million on Transformers, you're not putting 200 million in the stock market. Over the last 18 months, we've seen pretty massive gains in that sector. So your target isn't to make back your money, it's to make more money than you would have if you'd gone with a conservative investment. So your real target is production budget times 1.25 (marketing) times 1.15 (opportunity cost) times maybe 2.2 (to account for how much of the profits you actually keep, and realizing the Transformers weights towards the international.) My rough estimate puts 686 million as the effective Break Even point. Less than that and they really might as well have stayed home. Less than 600 and they probably actually lost money, not just underperformed the market. You could go into greater granularity but those figures should be roughly correct, give or take 20 million. Edited by Jim S, 28 June 2017 - 11:13 AM. I've been thinking about this, too. If they want to reboot in a hurry, it's an ideal place to begin. It really is, completely. Brand new director with a decent pedigree from Laika, new screenwriter (and only one), set in the '80s, no returning actors, featuring just Bumblebee and whatever enemy. Introduce a new Bumblebee design and eliminate any stagnating ties to AoE or TLK (if any) and you've got a reboot. Fastest way to cut ties would be to have Bumblebee actually talk. Edited by Spark, 28 June 2017 - 10:33 AM. A "prequel" to a series with confusing, contradictory, and abandoned continuity would be suicide. Are they going to start talking about the Allspark Cube again, in 2018? Make Bee speak normally and not be the Camaro again. Compromise, just have Bumblebee turn into the front half of a Camaro and the back half of a VW beetle. And he's voiced by Dan Gilvezan randomly shouting radio slogans. It's quite likely he'll be a Beetle, Volkswagen being the only piece missing (and they did already sign off on a Masterpiece, so...). If that aspect coincides with the good reboot we're waiting for, I can't wait to see the smug Geewunning associating any success with the vehicle mode and 80s setting more than anything else. And by "can't wait" I mean I wonder how much MORE distance I'm going to have to keep from the usual suspects. I still don't think he should be a VW bug. The '80s nostalgia wave has basically passed as far as most people are concerned, so pick something new. Keep the stripes, though. Voting for a Nissan Skyline R32 (although the dates make that tricky, since it happend in '89) or Toyota Corolla, personally. An '80s Camaro is pretty distinctive, but that tie probably needs to be cut. Edited by Spark, 28 June 2017 - 11:02 AM. Y'know, unlike a lot of other 80's and 90's-era "muscle" cars, 80's model Camaros are actually fairly cool-looking, so I think it'd be cool if he turned into one of those. I hope the Bumblebee movie doesn't get scrapped. Everything I've seen about it so far seems very promising. I'm not opposed to the idea of using it as a reboot, but a reboot just a year after the last installment in the franchise would be some kinda record. Actually, you really want to make it clear this is a new Bumblebee? Make him a motorcycle. From that link, make him a Piaggio T5. 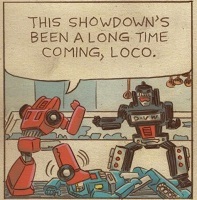 Backdoor Gobots movie! this thread is starting to sound a lot like the other gi joe thread. There's a lot I find disappointing about the movie series. But I'd rather have TF6 finish the story and we move on instead of a half reboot/half prequel Bumblebee story.